Former Tank employees Sara Katekaew and Stanley Liem are behind the new Miku Sushi, which replaces Laughing Bird. 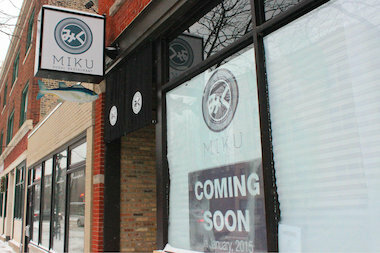 LINCOLN SQUARE — Two former Tank employees are bringing sushi back to Lincoln Square with their new venture, Miku, set to open soon in Tank's former location. Sara Katekaew, who spent a decade as Tank's general manager, and her husband Stanley Liem, a onetime waiter at Tank, are putting the finishing touches on Miku as they prepare to welcome their first customers Jan. 16. "I'm excited. I'm coming back to the old neighborhood I love," said Katekaew, who left Tank in 2013 when she became pregnant with the couple's son, now 16 months old. It's been less than a year since owner Franco Gianni pulled the plug on Tank and brought in chef Chrissy Camba to reopen the storefront at 4514 N. Lincoln Ave. as Laughing Bird, which offered Filipino-American food. Before he learned of the reconcepting as Laughing Bird, Liem said he approached Gianni about buying the place. When Laughing Bird shuttered after just five months, Gianni called to see if the couple was still interested in purchasing the business, according to Liem, who, with his wife also owns restaurants in Elmwood Park and Chinatown. "Franco knew Tank was always my baby. I started Day One with him," Katekaew said. "We said, 'Why don't we make it happen again?'" Though Gianni had grown tired of sushi, Katekaew is as passionate about the cuisine as ever. "Franco said, 'You sure Sara, going for sushi again?'" Katekaew said. "Yes, I understand you can get it from the grocery store. Bottom line: I believed I could deliver good food." In the span of a year, the storefront at 4514 N. Lincoln Ave. has gone from Tank Sushi to Laughing Bird and now Miku Sushi. With Miku, the couple plans to replicate Tank's high quality and reasonable prices while adding their own twist. The menu will also include skewers, ramen dishes and entrees such as Chilean sea bass. While the couple waits on their liquor license, Miku will be BYOB. The interior, which underwent a major renovation for Laughing Bird, has been significantly altered again, and will seat approximately 80 diners. "Laughing Bird was too masculine, it wasn't for families," said Liem. "We wanted it to be comfortable, inviting and to have a good flow." Banquettes have been installed along the walls and Laughing Bird's large bar has been scaled back to make room for a fish case and counter seating, where diners can watch the sushi chef at work. "I like that, it's so fun," said Katekaew. "Little kids, I hope they will love seeing the chef cook in front of their eye." 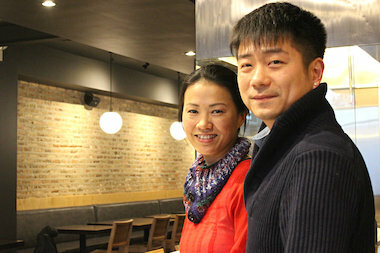 Though Katekaew and Liem now live in Chinatown to be close to Liem's mother, Miku re-establishes their roots in Lincoln Square, where the couple has "a lot of really good memories," Liem said. They chose the restaurant's name to signal their long-term commitment to the neighborhood and what they hope to come to represent. In Japanese, Miku means "lasting beauty," Liem said.